Scott Triphahn, Flyte Systems’ vice president said, “We find that many properties and transportation hubs, such as rail lines and intermodal terminals are providing FlyteBoards for their customers. The display is easily upgraded with Doppler Radar weather, local traffic, property promotions and other relevant content that travelers value. FlyteBoard and our other displays are often used as revenue generating solutions with information that is welcome throughout a traveler’s day.” Flyte Systems is the leading provider of airport travel information displays and digital signage content for hotels, corporate training centers, convention centers and related businesses. 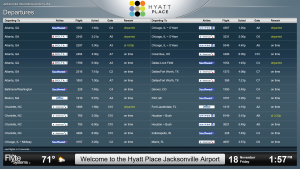 In addition to easy airport accessibility The Hyatt Place Jacksonville Airport is also convenient to some of the most pristine, unspoiled beaches in Northeast Florida at Little Talbot Island and Amelia Island. The property offers free Wi-Fi, hot breakfast, and complimentary 24-hour Stay Fit® fitness center. Flyte Systems is a division of Industrial Television Services (ITS), a Chicago-based digital signage company specializing in real-time information delivery. 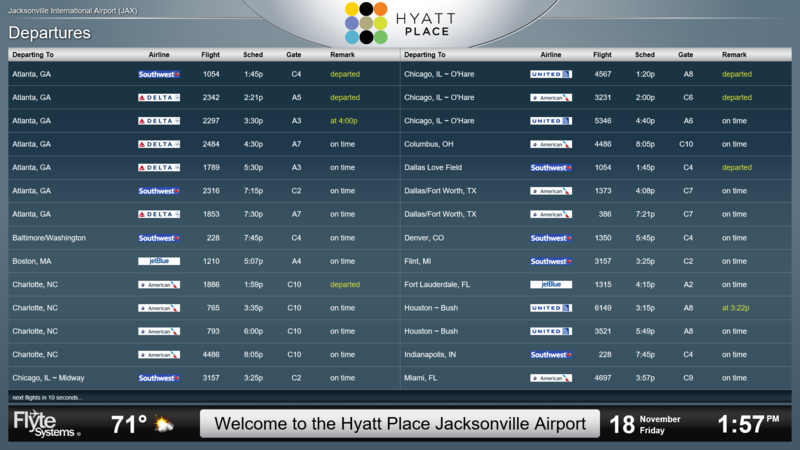 With over 56 years of experience, ITS ensures the accurate, instant, airport-centric updates integral to the Flyte Systems product suite.